Tickets include all panel discussions, readings, demos, access to the marketplace and special tastings, plus a $5 voucher that can be used towards any book or magazine purchase at the event. 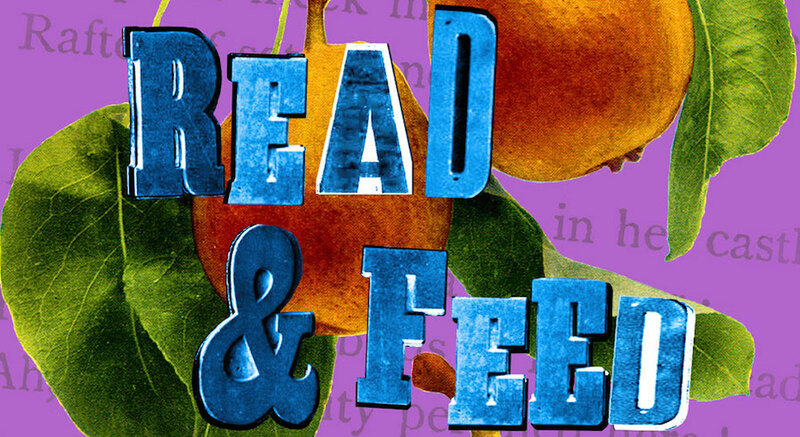 Basilica Hudson and CLMP (Community for Literary Magazines and Presses), present READ & FEED, a new festival for food and literature. This projected annual event brings together artisanal makers of food with artisanal makers of literature. This inaugural “mini-festival” will feature panel discussions bringing together writers, farmers and chefs, cooking and mixology demonstrations, a marathon reading of John Cage’s Diary: How to Improve the World (You Will Only Make Matters Worse), and a marketplace featuring more than twenty small press publishers and artisanal food makers, plus spectacular eats and drinks. Much of READ & FEED will be broadcast live on Wave Farm’s WGXC 90.7-FM in New York’s Upper Hudson Valley and streamed online at wavefarm.org. // Two Best Friends and a Bottle of Wine—Lydia Davis, Lynne Tillman, moderated and wine tasting by Michael Albin. Legendary authors Lydia Davis (Can’t and Won’t: Stories) and Lynne Tillman (What Would Lynne Tillman Do?) engage with each other and the audience over a wine tasting provided by Hudson Wine Merchants. // Food, Farming, and Spirituality—Sarah Chase, Marie Mutsuki Mockett, Zak Pelaccio, moderated by Rozanne Gold. Celebrity chef Zak Pelaccio (Fish & Game, Eat With Your Hands), author Marie Mutsuki Mockett (Where the Dead Pause, and the Japanese Say Goodbye), and organic farmer Sarah Chase (Chaseholm Farm) join renowned cookbook author Rozanne Gold (Radically Simple, Cooking 1-2-3) to discuss how spirituality manifests itself in the culinary arts. // Reading, Drinking, Eating, Writing—Ava Chin, Kimiko Hahn, Harold Schechter,moderated by Rosie Schaap. New York Times “Drinking” columnist Rosie Schaap (Drinking with Men) and feature award-winning poet and President of the Poetry Society of America Kimiko Hahn (Brain Fever: Poems), author Ava Chin (Eating Wildly: Foraging for Life, Love and the Perfect Meal), and true crime writer Harold Schechter (Man-Eater: The Life and Legend of an American Cannibal) explore food as a language. In collaboration with the John Cage Trust, an all-star cast of readers, including poet Bernadette Mayer, Magnetic Fields leader and songwriter Stephin Merritt, master puppeteer Dan Hurlin, jazz pianist Marilyn Crispell, and many others, will perform a marathon reading of John Cage’s Diary: How to Improve the World (You Will Only Make Matters Worse), from a newly published edition by Siglio Press printed in multiple texts and fonts; the readers will change with every one of these changes, sometimes reading only a single word at a time. Have a poet or literary editor read a single poem to you aloud, in a private room, and then be handed a copy of the poem to take home. The READ & FEED Marketplace, in addition to featuring scrumptious things to eat there and delicious food products from Chaseholm Farms, Raven & Boar, Hudson Standard, Moto and others, will have literary books and magazines, as well as cookbooks, available from some of America’s very best small press and literary magazine publishers, including Europa Editions, Conjunctions, Nightboat Books, The Song Cave, Fence, and many, many more. Spotty Dog Books & Ale will also provide books by many of the featured authors and a chance to have them signed. //Cooking with the Muse // A talk and tasting by chef and cooking instructor Myra Kornfeld and award-winning poet, scholar and professor Stephen Massimilla, authors of Cooking with the Muse: a Sumptuous Gathering of Seasonal Recipes Culinary Poetry, and Literary Fare (Tupelo Press 2016). //The Belle Reeve // Marianne Courville of The Hudson Standard. Learn how to mix (and taste!) this quintessentially southern cocktail made with bourbon, ginger liqueur, lemon and Hudson Standard’s Peach Lavender Shrub. Come hungry and ready to read! And stay tuned for more details. READ & FEED is organized by Basilica Hudson in partnership with CLMP (Community of Literary Magazines and Presses), and with the collaboration of the John Cage Trust. Amazon Literary Partnerships has generously provided partial support for the event. CLMP—the Community of Literary Magazines and Presses—ensures the vitality of small literary publishers and communicates the art of literary publishing to readers, writers, booksellers, librarians, educators, funders, and other literary stakeholders. CLMP believes that small publishers make up an underserved, uniquely vulnerable and essential field that connects the greatest diversity of writers to equally diverse communities of readers. Since 1967, CLMP has worked to bring small literary publishers together to form a mutually supportive community that is often at the vanguard of progress. CLMP, a 501(c)3 nonprofit organization, provides technical assistance, facilitates peer-to-peer learning and group action, and builds bridges to connect diverse communities of literary stakeholders. The John Cage Trust was established in 1993 as a not-for-profit institution to gather together, organize, preserve, disseminate, and generally further the work of the late American composer, John Cage. The Trust functions as both a business concern and an archive and repository for Cage’s work, and also works closely with others in the promotion and placement of Cage’s work.